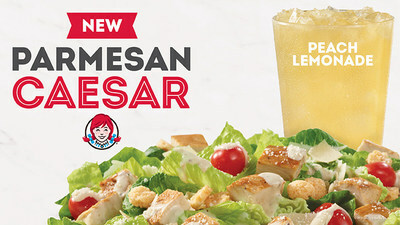 DUBLIN, Ohio, March 25, 2019 /PRNewswire/ -- Balance can be hard to achieve when you're constantly on the go, but when it comes to finding middle ground between delicious flavors and quality ingredients, Wendy's has you covered with its fresh made-in-restaurant daily salad line. From savory to sweet and simple to bold, Wendy's offers a variety of flavor combinations that you wouldn't expect from fast food salads. Wendy's® was founded in 1969 by Dave Thomas in Columbus, Ohio. Dave built his business on the premise, "Quality is our Recipe®," which remains the guidepost of the Wendy's system. Wendy's is best known for its made-to-order square hamburgers, using fresh, never frozen beef**, freshly-prepared salads with hand-chopped lettuce, and other signature items like chili, baked potatoes and the Frosty® dessert. The Wendy's Company (NASDAQ: WEN) is committed to doing the right thing and making a positive difference in the lives of others. This is most visible through the Company's support of the Dave Thomas Foundation for Adoption® and its signature Wendy's Wonderful Kids® program, which seeks to find every child in the North American foster care system a loving, forever home. Today, Wendy's and its franchisees employ hundreds of thousands of people across more than 6,700 restaurants worldwide with a vision of becoming the world's most thriving and beloved restaurant brand. For details on franchising, connect with us at www.wendys.com/franchising. Visit www.wendys.com and www.squaredealblog.com for more information and connect with us on Twitter and Instagram using @wendys, and on Facebook at www.facebook.com/wendys.